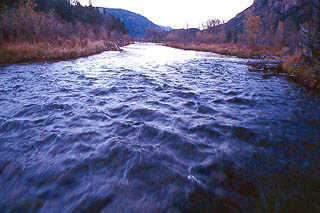 Description: Approximately 2 miles of 60-foot-wide high country river that winds through pastures and meadows. Browns and rainbows rise to late summer and fall dryfly hatches. Trout up to 20 inches have been reported. Location: This property is located northwest of Antonito, Colo. below Platoro Reservoir near the New Mexico border.